he High Voltage Tester supplied and exported by us is manufactured as per the set standards and regulations. This High Voltage Testers are available in AC and DC types and are used for testing HV cables after installation and repair for ensuring efficient performance. It also indicates voltage withstands level and current leakage level of the cable during the testing period. 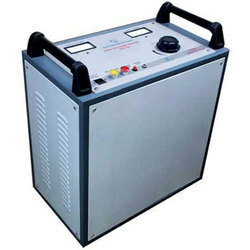 We manufacture High Voltage Tester using advanced technology and make it available in the market at affordable prices. Looking for High Voltage Tester ?